As far as I know, there is a typo in sound-call script during the basement fight. It calls for x0003.mp3 voice file instead of x003.mp3, so it will throw in a "not found" error. Easy fix in cs, tho. Since I was in search for this fix, what would I need to change in CS to solve it? I'm green again when it comes to modding Morrowind. Are there known incompatibilities with this mod? 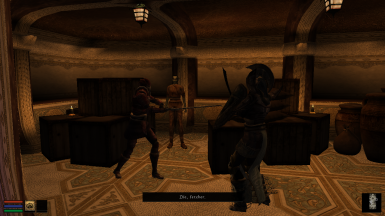 A few monthes ago, it worked fine but I've recently started over and now have a semi-blocking bug with TRtM: I'm sent to Mournhold by the Miriel guy in Vivec, go in the basement and watch the two guards arguing. Then, they stop talking and do nothing (I seem to remember that they're supposed to fight or something? ), the situation is stuck, I can't talk to either guard or the Miriel guy there. The only way I've found to continue is to attack one of the guards, which then triggers the rest of the dialogue (before they can attack me or try to arrest me) and it fades to black, then I'm back in the scene, the guards are gone and I can talk to Miriel to continue as expected. The annoying thing is that I now have a bounty on my head because it takes into account that I attacked the guards. I use quite a number of mods and tweaks, though it was already the case in my previous game when it worked and I don't see something obvious that would affect Mournhold. For the record, I play using OpenMW and use Tamriel Rebuilt + Morrowind Rebirth (that was already the case the previous time but they were in older versions, so maybe something changed that affects your mod). I use some mods that add various dialogues to characters (like LGNPC). Another thing that may be related: in my previous game, I had already been sent to Mournhold the regular way (assassins ? speaking to guards ? going to Ebonheart ? being transported to Mounrhold), so maybe there's some kind of trigger that happened that way? so for some reason the sound file is corrupt and wont let me extract it. Thank You so Much for your work, HangHimHigher Can't wait to dive in!! When I equipped the Mages Guild teleportation amulet for the first time I selected "none" (or whatever the optionon not to teleport anywhere is) as I wanted to check my magicka first and verify the cost after the transportation. I guess this somehow broke the script, as when I equip the amulet again, nothing happens. Is it a known issue? I see you posted a compatibility patch for the master index plugin. In my game, I had no problems to finish that quest as well as yours. But then again I was using a patched master index plugin, so who knows. In my opinion that amulet of Folms Mirel is OP too, but I don't mind as much as the former poster... I would enjoy a much more expensive teleport though. Like... a certain percentage of max magicka (15~30%), or 15 MP whatever is higher. Currently on my mage character I don't even notice it when I use it. Thanks for the feedback, and for the kind words! The patch isn't necessary to play the two together -- all it does is ensure that Folms Mirel gives you the "work" topic in dialogue, whereas before RtM would block the greetings added by Master Index which gave you the topic. If you play the two together without the patch, all you really need to do is get that topic from somewhere else, and you should be fine, if that makes sense. That´s a good balancing idea. Make it very magically expensive, at least for non mysticism players. Make a version without amulet! Why, if you don't mind me asking? Do you feel it's unbalanced? I can understand not wanting to use it, but I don't see why you can't just sell it, throw it away or even console it out of existence if you really don't want it around. If you really hate it, I could tell you how to delete it from the .esp file. Hell. yeah! Tell me how! I dont want cheat items in any way in my game. You would say it is a convenience one, but it is an easy way to bypass the travel system, I hate it. Load up the mod in the CS, open dialogue, go to the topic "arethan and athal", go to the entry which starts "Now, I have little in the way of", go to the results section and delete the line which starts "Player->AddItem...". You can edit the dialogue of the entry to make it make sense as well. Save and clean the .esp file. Or you could in-game just enter into the console "Player->RemoveItem "NON2_MGAmulet" 1. I would also suggest that you work on your manners. I don't mind helping people or hearing criticisms about my mods, but you come off as entitled and demanding. Sorry for my manners, english is not my mother language. I use this trade-talk in a very direct way. Thanx for the instructions!! This mod also messes with Propylons a bit, since it alters his greeting post-quest completion as well. I had to find another npc to tell me about them so I could ask him. It's great otherwise. The amulet is really handy. 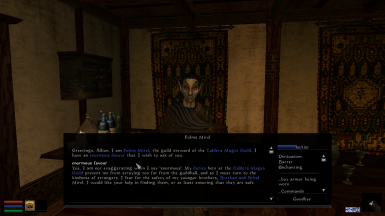 Edit: You can ask about him in other guildhalls, (I asked the Altmer alchemist in Ald'ruhn) and they'll say he's the one in charge 'here' when they're not in Caldera. Thanks for the heads up! I'll definitely fix the new dialogue being non-discriminating in an update. And I completely forgot that adding new greetings post-quest might block other quests too. Perhaps I'll move those post-quest lines of greeting to a lower level so that they wouldn't block other quest-related dialogue. I bet it would help if I RTFM and used the correct version. Oops. Great looking mod. Does it conflict with LGNPC?